There are no economic reports in Japan however the US is releasing Natural Gas Storage, Prelim Wholesale Inventories m/m, Goods Trade Balance, Durable Goods Orders m/m, Unemployment Claims and Core Durable Goods Orders m/m. The support rests at 110.660 with resistance at 111.260 which both lines are below the weekly pivot point at 111.660. The EMA of 10 is moving with bearish bias along the descendant channel and it is below the EMA of 100 and above the EMA of 200. The RSI is rising towards 50 level, the Stochastic is moving in low ranges and the MACD indicator is in negative territory. The ADX is not showing any signals. 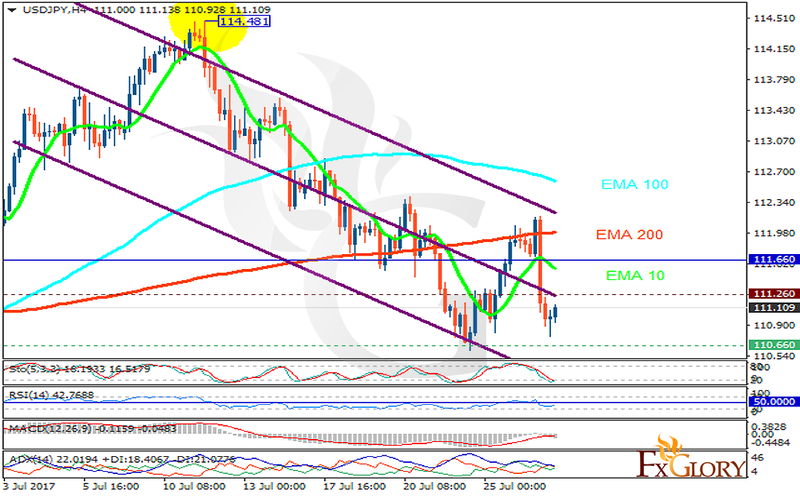 It seems that the pair will continue its bearish trend towards 110.29.